It’s the start of the Feijoa season. 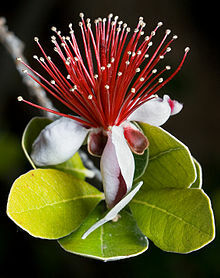 Much as I miss my Grapefruit tree, I miss my Feijoa tree too. Gone were the days when there were so many fruits to pick that I would have a whole larder full of jams and chutneys made from these fruits from my very own garden. For the last four seasons (years), bags of these fruits would be offered free, placed down my drive next to my letter box for motorists or neighbors to stop and pick up . It’s been a year now since I have down-sized and moved to my new home, yet to have any mature fruit trees. 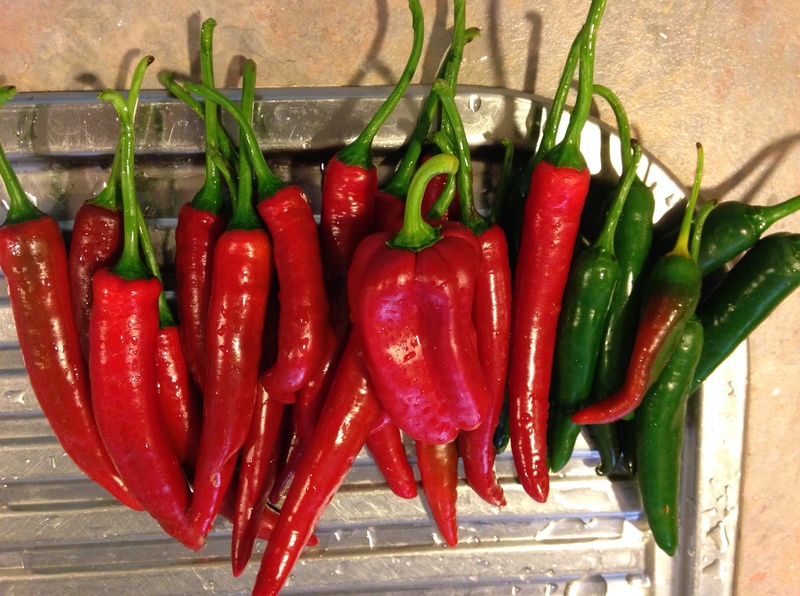 I have however, a few chili plants and have chilies that will last me for months and months. 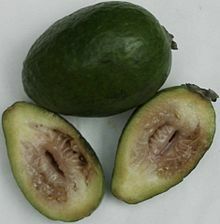 I have never ever seen or tasted a feijoa until I moved to New Zealand. 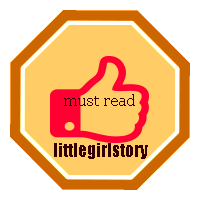 Below is an introduction of this interesting fruit. The fruit, maturing in autumn, is green, ellipsoid, and about the size of a chicken egg. It has a sweet, aromatic flavor which tastes like pineapple, apple and mint. The flesh is juicy and is divided into a clear gelatinous seed pulp and a firmer, slightly granular, opaque flesh nearer the skin. The fruit falls to the ground when ripe and at its fullest flavor, but it may be picked from the tree prior to falling to prevent bruising.The fruit pulp resembles the closely related guava, having a gritty texture. The feijoa pulp is used in some natural cosmetic products as an exfoliant. 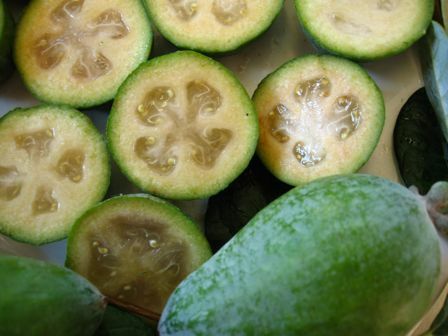 Feijoa fruit has a distinctive, potent smell that resembles that of a fine perfume. The aroma is due to the ester methyl benzoate and related compounds that exist in the fruit. It is a warm-temperate to subtropical plant that also will grow in the tropics, but requires at least 50 hours of winter chilling to fruit, and is frost-tolerant. When grown from seed, feijoas are noted for extremely slow growth during their first year or two, and young plants, though cold tolerant, can be very sensitive to high wind. In the Northern Hemisphere, this species has been cultivated as far north as western Scotland, but under such conditions it does not fruit every year, as winter temperatures below approximately −9 °C (16 °F) kill the flower buds. Summer temperatures above 90 °F (32 °C) may also have an adverse effect upon fruit set. Feijoas are somewhat tolerant of drought and salt in soils, though fruit production can be adversely affected. Tolerant to partial shade, regular watering is essential while fruit is maturing. Quantities of the fruit are grown in New Zealand, where it is a popular garden tree and the fruit commonly is available in season; the season runs from March to June. 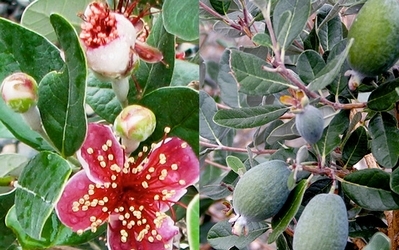 Feijoas are occasionally to be found as landscape plants in the far SouthernUnited States, in regions from Texas to Florida, and southern California, though fruit set can be unreliable in those locations. They are also grown in parts of northern California for their fruit. Fruits are an extremely rare sight away from cultivation areas, and when they can be found, they are often very, very expensive due to scarcity and demand even in places where the fruit isn’t well-known. The fruit usually is eaten by cutting it in half, then scooping out the pulp with a spoon. The fruit has a juicy, sweet seed pulp and slightly gritty flesh nearer the skin. If the utensils needed to eat it this way are not available, the feijoa may be torn or bitten in half, and the contents squeezed out and consumed. An alternative method is to bite the end off and then tear the fruit in half length ways, exposing a larger surface with less curvature and using one’s teeth to scrape the pulp out closer to the skin. This method results in less waste of the fruit.A feijoa may be used as an interesting addition to a fruit smoothie, and may be used to make wine or cider and feijoa-infused vodka. The flavour is aromatic, very strong and complex, inviting comparison with guava, strawberry, pineapple, and often containing a faint wintergreen-like aftertaste. It also is possible to buy feijoa yogurt, fruit drinks, jam, ice cream, and such in New Zealand; as well as vodka like 42 Below. It also may be cooked and used in dishes where one would use stewed fruit. It is a popular ingredient in chutney. The very strong, complex flavour can make using feijoas, in combination with other fruits or vegetables, a creative and complex undertaking.Fruit maturity is not always apparent visually, as the fruits remain the same shade of green until they are overripe or rotting. One usually may sense ripeness, however, by giving the fruit a soft squeeze; a ripe feijoa will yield to pressure somewhat like a just-ripe banana. Generally, the fruit is at its optimum ripeness the day it drops from the tree. While still hanging, it may well prove bitter; once fallen, however, the fruit very quickly becomes overripe, so daily collection of fallen fruit is advisable during the season.When the fruit are immature, the seed pulp is white and opaque. It becomes clear and gelatinous when ripe. Fruits are at their optimum maturity when the seed pulp has turned into a clear jelly with no hint of browning. Once the seed pulp and surrounding flesh start to brown, the fruit is overripe, but still may be eaten, or used to make a delicious juice. The flower petals are edible, with a flavor that is slightly sweet with hints of cinnamon. The most common use is as an addition to salads. They regularly are consumed by birds. 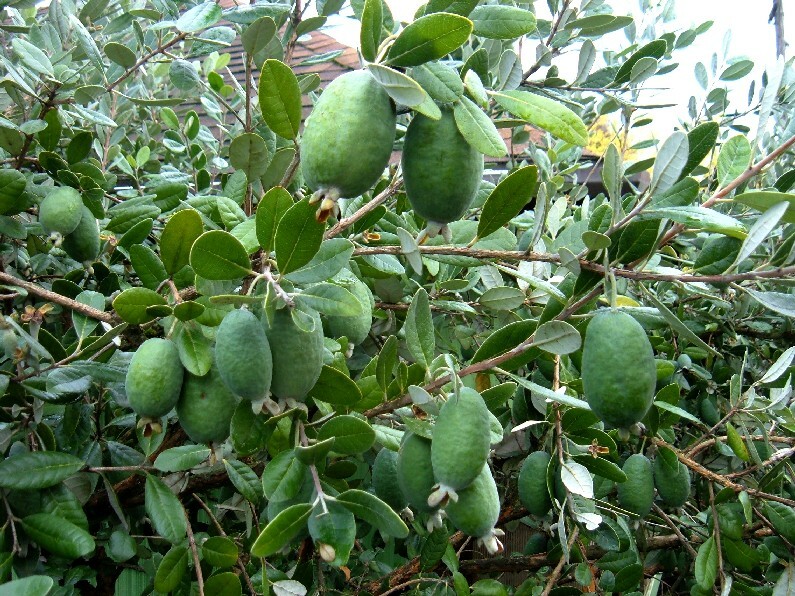 Feijoa is also cultivated in Azerbaijan. Besides its consumption in natural form, feijoa jam and compote is prepared and produced both in home and on industrial scales.